In 50 days I’ll be on a plane to Germany! Before I head to Dresden for the Dresden Marathon I’ll spend a few days in Berlin as a tourist with a dear friend from high school – and I am so excited! I haven’t been to Germany since I was a kid. As a matter of fact, I started school in Germany. My dad was stationed in Augsburg and I have fond memories of my little brother running around the apartment trying to put sentences together in German. I was still in elementary school when we moved back to the United States but unfortunately we didn’t bring the German language with us. We stopped using it at home and my understanding of the German language is still that of a seven year old. Fast forward several years later: my high school didn’t offer German, so I opted for 3.5 years of French and a year of Spanish. In college I took a year of French (thanks to my wonderful high school teacher – I was able to test out of the 101 courses!) and attempted to take one year of German. Man, my German was rusty. I struggled through that class – but I finished it. Then I followed up with a Germanic Mythology course – which I loved – but we didn’t have to speak German in class so my German skills slowly slipped away – again. I’ve been out of college for a few years now – seven to be exact – and haven’t used much German in my day-to-day. My German is still rusty. 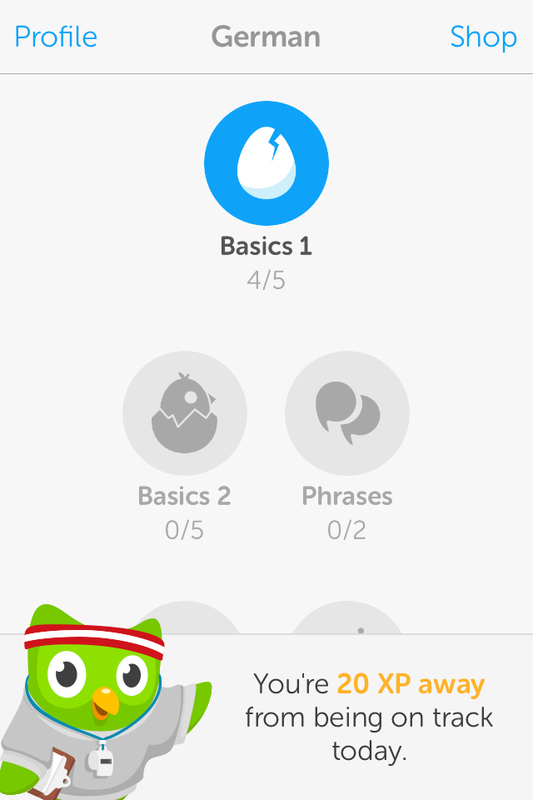 In preparation for my trip as an athlete ambassador I downloaded the app Duolingo. This is a free app without ads – seriously, NO ADS! – offers Spanish, French, German, Portuguese, Italian, and English. It’s quick. It’s fun. And before I know it I find myself spending 20+ minutes learning new vocabulary words and phrases. After using the app for a few days I quickly shared it with Daniel, Krista, Sarah, and Shake – who have all since downloaded it as well. We’re loving it – and Dorit at Dresden Sister City, Inc. can’t wait to test our skills. Duolingo has fantastic reviews. And here’s another one: I’m still on “basic” but already I can’t recommend this app enough. It’s fun, keeps score (important for those of us who are competitive), and has an adorable green owl that acts as your coach – reminding us we all need a little push from time to time. If you’re wanting to learn a new language check out Duolingo.